communication news and reviews for Windows Mobile Pocket PC, Palm, Microsoft Smartphones and Symbian cell phones. I am not really an AOL Instant Messenger fan, especially as a mobile messenger solution, but there are so many people using it and waiting for update versions both for PC and for mobile devices. I am very pleased to introduce you one very nice Pocket PC client for Twitter. With the rise of Twitter users and the increase in the adoption of Windows Mobile devices around the world, the need for a client that allows those Windows Mobile users to utilize as many of the features of Twitter as possible without needing to be at a desktop computer increased as well. And as the rates for mobile Internet access and the surcharges incurred by mobile providers for SMS messages increased, the need for a full-featured, yet simple-to-use, client presented itself as a need. And even though Twitter provides a web-based interface for mobile devices, its functionality was not as robust as those found on the desktop-version of the web interface. Thus, Twobile was born! Twobile directly connects to Twitter and all transactions are performed between your Windows Mobile device and the Twitter service. For more information and downloads go to Freeware Pocket PC site. Google has recently activated IMAP support for its popular Gmail E-Mail service. This means that you can download your E-Mails to your PC or Mac, using Outlook or whatever you are using, and in addition you can access the same inbox from your mobile device. Google is also offering a mail client for mobile devices, but for the moment it only supports J2ME-enabled devices and since not all Windows Mobile devices includes J2ME but Outlook Mobile, this is the better option anyway. E-Mail clients using IMAP generally leave messages on the server until the user explicitly deletes them. This and other options of IMAP operation allow multiple clients to access the same mailbox. While IMAP offers access to the mail store on the server, the client may store local copies of the messages, these are considered to be a temporary cache and the server's store is authoritative. 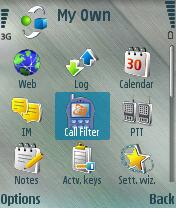 CallFilter is recently released freeware application working for all Symbian versions, as the developer says. It allows you to block / unblock incoming calls as easy as setting up a filter rule plus it keeps a log with all the rejected calls. I like the idea of rejecting incoming calls on the go and to do it for Free. Call Filter is a utility application realised under the concept "Simple Yet Efficient" for your Symbian devices. It allows you to hang-up any incoming calls from contacts selected as a filter rule in main application screen. Gives you a very convenient and quick access to block/unblock some phone number at runtime. This is convenient in situations when your BOSS is always on your head and you don't want to answer his call at certain moments during the day, it takes a few clicks and you are done blocking your BOSS calls. The logs screen maintains a list of rejected calls and allows placing a quick call or an sms to the rejected phone number. So this is what we call "Simple Yet Efficient". "With HTCmail, small to medium enterprises can benefit from anywhere access to information without the expense or ongoing commitment of on-premise software and IT skills." Congratulation HTC for pushing Windows Mobile 6 forward and forward in your attempts to make the whole Windows Mobile experience better. The situation is simple - You can't take that call, but don't want the person on the other end to wonder where you are or what you're doing? And here your worries ends. Ignore with SMS is recently released program for Windows Mobile devices, which just needs a a simple button tap and it takes to quickly and easily send that person a text message letting them know you're in an important metting or at the movies. Ignore with SMS is available for free download at Freeware Pocket PC site. Transfering contacts or calendar items from one Windows Mobile device to another is and issue that concerns most of the handhelds owners when upgrading to new device. With devices running operating systems prior to WM5 this was an easy job (you just brought up the built-in keyboard SIP and tapped Ctl, and, then, A, to select all contacts and mass-transfer all this via both infrared and Bluetooth to any other device). But the WM5 ha sputted this situation in other direction. It has no option of mass-select any kind of PIM data for transfer unless you use a PIM extender like Pocket Informant. But there is also a new way to do this i have just read about in Werner Ruotsalainen article for pocketpcmag.com. It is based on the free application PIM Backup and even if it is your second time using Windows Mobile application you will have no problem dealing with it. Here you can read complete post Menneisyys wrote about this issue and learn how to do it. Thanks for the great article again Menneisyys. SHAPE Services GmbH has just released one very nice application which lets you chat with Skype friends or call any PC/mobile/landline phone from Symbian S60 wherever you are, regardless of the WiFi zones. IM+ for Skype enables voice and text communication with other Skype users and provides cost-effective calling to landlines and mobiles. IM+ Skype Call Skype users from any Java, Symbian S60 v2 or UIQ mobile. With IM+ for Skype Software you can talk with other Skype users all over the world. Enjoy high quality of voice communication - clear sound, no delays even for long-distance calls! Make cost-effective calls to any destination. IM+ for Skype Software is based on SkypeOut service that allows users to make and receive calls for extremely low fees. See who is online and chat with Skype users. Have conversations with other users who are logged in with their Skype accounts on PC. Text messaging is cost effective way to say something instead of sending an SMS. IM+ Skype is available for Free download at Symbian Freeware site. Textr is application for Windows Mobile 5 devices which organizes SMS Text Messages into easy to read conversations. This gives you the abbility to easily see entire conversations via text message with a single contact in a chat-like interface. * Photos for your contacts which use the default contact photo on your device. * Icons depicting "new" message, "read" and "unread"
You can try textr for free for 21 days (download here) and if you like it buy it for $14.99 here. Consider that there are free applications that are able to show your text messages as threaded conversations, SMS Threader for example, but they lack the cool photos support and other features of textr. mChat, the ICQ/Jabber/Mail.ru Agent client with Cyrillic language support, has just been updated to v2.2. mChat has cool functions li storing chat history, changing the chat icons, supports VGA devices, HTTP/Socks5 proxy connections, contacts in 2 column, additional status messages, change password options etc. * ICQ changes - added settings x-status, text x-status and other statuses, read status text, typing notifications (only receiving), added detect more icq clients. 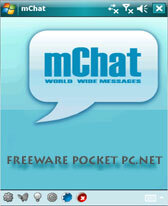 mChat v2.2 is available for free download at Freeware Pocket PC site.